Film Review: ‘Words and Pictures’!! What is mankind’s highest form of expression? Word or Pictures? Or maybe Words and Pictures. 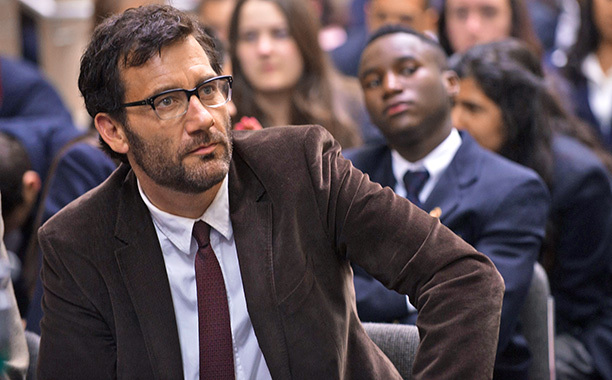 The film Words and Pictures is a clever, cheeky comedy starring Juliette Binoche and Clive Owen that poses and addresses this question. Jack Marcus (Owen) is an honors literature teacher at a preparatory high school and a somewhat functioning alcoholic. Indirectly the film informs the viewer that Marcus’ alcoholism had destroyed his marriage, placed a huge stress on his relationship with his son, and affected what is near and dear to his heart, the teaching of words. His alcoholism threatened his position because Marcus was consistently late, annoyed other teachers and didn’t always grade his students’ papers or stick to a curriculum. Marcus has a brief moment of victory each day while in the faculty lounge when he challenges the other teachers to a contest of guessing the largest syllable word. 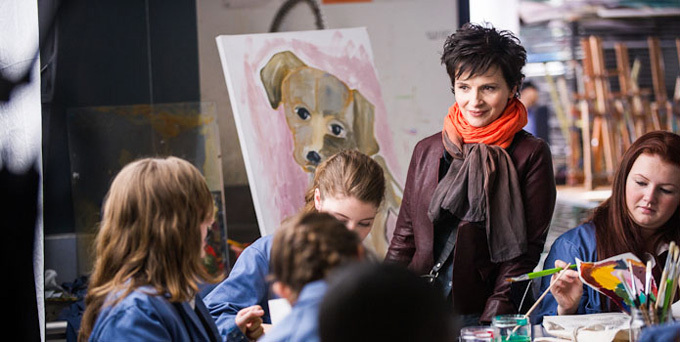 On the verge of Marcus potentially losing his job, Dina Delsanto (Binoche) begins her journey as the newly appointed honors art teacher. Delsanto is a renowned artist whose body has been ravaged by RA (admittedly, I didn’t know what RA stood for), which makes every action a challenge from getting dressed to her love of painting. In order to continue painting with Rheumatoid Arthritis (RA), she became innovative with pulleys, rafters, braces, and tape padded paintbrushes. Binoche was a perfect choice for this role, not just because she is an AMAZING actress, but because she is also a painter in real-life. In fact, the artwork created in the film was either the work of Binoche or the student actors. The creations were breath-taking riots of color and movement. From the moment Delsanto walked into the lounge, Marcus challenged her to his little game. She dismissed him as one would an annoying fly. The taunting that existed between the two spurned a heated debate among the students and Marcus declared war. Delsanto, known for not taking crap from anyone, pushed right back at Marcus. The war is the grand challenge of the question: What is mankind’s highest form of expression? I have enjoyed Clive Owen in a few of his films including his role as Sir Walter Raleigh in Elizabeth: The Golden Age. Owen showed strength and depth of character in Elizabeth: The Golden Age, which makes his role as Marcus all the more infectiously endearing. Marcus is not noble, not courteous; he is a mess so unlike the character Sir Walter Raleigh. However, as the film progresses, he grows on you through the film like a fungus. Your heart will ache for Marcus. For a long time, I have admired and reveled in the acting genius that is Juliette Binoche. She won me over as Catherine Earnshaw and Cathy Linton in Wuthering Heights. Binoche brought this timeless classic to vivid life. In Chocolat, Binoche was a refreshing breeze that swept light into a small French village. In Words and Pictures, I saw a different end of Binoche’s range of emotion. She was so courageous struggling with the disease of Rheumatoid Arthritis. I was overwhelmed with empathy because of her pain. With every stroke of her paintbrush or splash of paint dumped upon the canvas, I was elated at the beauty she produced. She is the real hero of this film saving the day again and again with Marcus as well as her students. Words and Pictures is a brilliant romantic comedy that I highly recommend to anyone. Especially, those who have struggled to overcome something that has you stuck in an endless loop of frustration and pain. You will be inspired. Although use of the Internet was prohibited in the game, if I were ever to meet Marcus, I’d challenge him with Pneumonoultramicroscopicsilicovolcanokoniosis, 19 syllables. Take that Mr. Know It All! Film Review: ‘Clouds of Sils Maria’! This entry was posted on Wednesday, June 4th, 2014 at 11:28 pm	and is filed under Film, News. You can follow any responses to this entry through the RSS 2.0 feed. You can skip to the end and leave a response. Pinging is currently not allowed. « Josh Trank Will Helm A ‘Star Wars’ Stand Alone Film! !